🌟 I can’t believe that this is coming to an end! Sarah J Maas, here are 5 stars and Thanks a lot!! To a better world! I love the artwork on this post!! 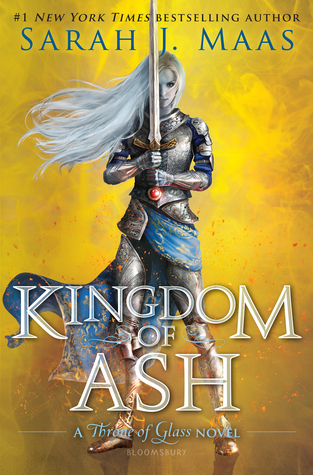 It’s gorgeous ❤ and good to know that Kingdom of Ash is worth a read; I almost give up on Sarah J Maas' books a while back but will definitely give this one a go! I believe I am one of the few that have only ever read one SJM book. I believe it was the first in this series and I honestly don’t recall why I didn’t continue. I have been thinking of adding her work back to my TBR for a long while and reading through this post has certainly encouraged the thought. Reading 7 books in a series is no small commitment. Even if you hate-read this series, there is a small part of you that is doing it because you enjoy it. There were some books that I truly loved (Crown of Midnight, Tower of Dawn), there were some books that I thought were just okay (Throne of Glass, Queen of Shadows, Kingdom of Ash), and then there were some that I just didn’t enjoy (Empire of Storm, Heir of Fire). I agree that SJM doesn’t know how to write diverse characters just like J.K. Rowling. Rather than trying to do a bad version of these characters, I would rather they just no include them. You do more harm than good that way. I would say this series averages 3 stars from me, but I don’t think that’s a bad thing. I totally agree, I loved Crown of midnight, Empire of storms and KoA, I didn’t enjoy Heir of fire and Queen of shadows. I also agree that you must enjoy a series if you read 7 books for it, no matter what you say, you’re enjoying it. I think it was something like 3.5/3.75 for me! I’m currently reading this… I SKIPPED (I’ll come back) your review and went to the star rating… I feel so much better that you gave it 5 stars. I’m terrified of this one! lol! I mention that it may not have been worth 5 stars but it gave me all the feelings and I couldn’t resist! Yup, I’m not expecting to be a fiver but I’m hopeful! 🙂 I’ve made it about 580 pages and had to stop for the day but I didn’t want to!